Would love to have this hanging in my room. One of the coolest Kill Bill posters I've seen. Buy it here. I think I might soon watch this movie again! You inspired me! Followed! yo that poster is pretty insane. I loved the Kill Bill duology. This poster is well drawn as well. Very nice poster, isn't there supposed to be another sequel in the works or something? That, right there, is a BADASS poster. Thats some badass poster. I would love to have one. kill bill is my favorite movie ever :X haven't watched the second volume yet tough.. Very cool. Looking forward to the next one. They are selling it, check the link i posted under it, its in the "Shop" section. That poster looks awesome. I love it. I feel really tempted to get this, looks fu**in awesome! 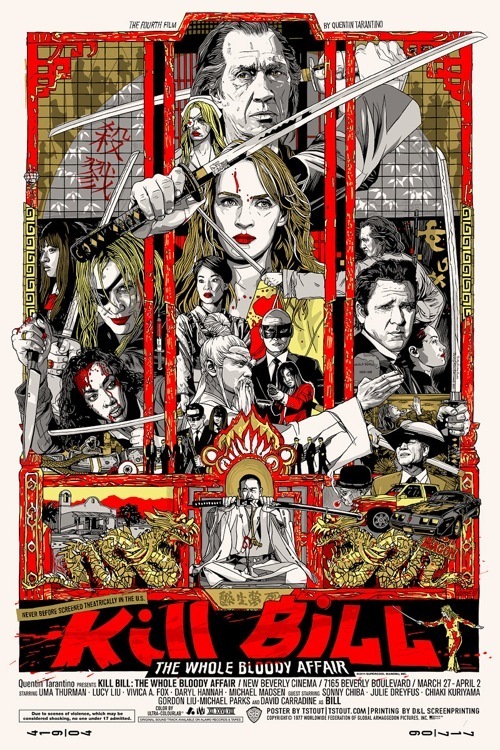 The Kill Bill poster is one awesome poster and really looks the part. I would also love to have that hanging in my room. Thanks for this post. Dude, that poster is amazing. I'd totally enjoy having that in my room as well! My website has a lot of exclusive content I've either authored myself or outsourced but it looks like a lot of it is popping it up all over the internet without my authorization. Do you know any ways to help protect against content from being stolen? I'd definitely appreciate it. It is really a nice and helpful piece of info. I'm glad that you just shared this useful info with us. Please keep us up to date like this. Thank you for sharing. thus i came to “return the favor”.I'm trying to find things to enhance my web site!I suppose its ok to use some of your ideas!! doubt, you've hit the nail on the head. The issue is something too few men and women are speaking intelligently about. I am very happy that I came across this in my hunt for something concerning this. thought I may as well check things out. I like what I see so now i'm following you. Look forward to going over your web page for a second time. flounder. Clutter steals workers' motivation because they expend all their energy just trying to find what they need to begin a task. yet effective. A lot of times it's tough to get that "perfect balance" between user friendliness and visual appearance. I must say you have done a amazing job with this. In addition, the blog loads very fast for me on Opera. Exceptional Blog! smartly written article. I'll make sure to bookmark it and come back to learn more of your useful information. Thank you for the post. I will certainly return. useful sites on the internet. I will highly recommend this website! Hello there, just became aware of your weblog through Google, and found that it is really informative. I'm gonna watch out for brussels. I'll be grateful in case you proceed this in future. Many other folks shall be benefited out of your writing. Cheers! formidable task and our whole neighborhood will likely be thankful to you. I too am an aspiring blog blogger but I'm still new to everything. Do you have any helpful hints for beginner blog writers? I'd definitely appreciate it.